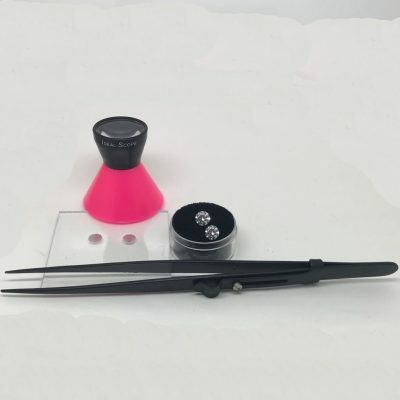 A Lexan 2″ x 2″ clear plate which allows the user to place one or two diamonds so that the stones are secure and steady while using the ASET or Ideal-Scope to examine their cut quality or to compare the light return and cut quality of two competing diamonds. 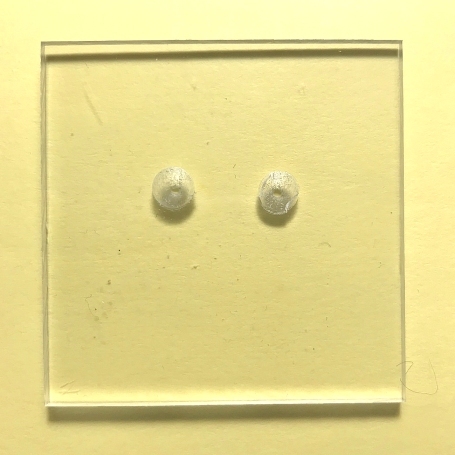 You might spend less time looking for a stone which popped out of your tweezers. Retailers can use this across the counter to set up two diamonds and let the customer readily view and compare them. Consumers find this device less of a challenge than handling and steadying a tweezers. This plate allows illumination from behind with your Smart Phone screen. This small part is light and durable. A smart phone App, such as Screen-Light, will work with this plate. The Ideal-Light is no longer in production and will not be offered when our stock soon run out. We have a few lights left to fill orders placed on ideal-scope.com for US delivery. We have removed the Ideal-Light from our US shopping cart. We can ship one of these Comparison Plates in a First Class envelope for $1, or two of these for $2 instead of using Priority Mail for $11. Choose Priority Mail if you are buying this item by itself and wish to save most of the shipping costs. We will refund the correct amount, $10 for 1 or $9 for 2, from PayPal as soon as the order is processed for shipping, if you request the slower, First Class, mail service.